I haven't been with you, my friends, for quite some time, and the writing topics have been swooping around my brain lately, eying me curiously to check if I'm dead. Not so. Although I HAVE wondered if my blogging days were... but I miss it, and I miss you, my digital friends, and I realize it more with each word I type. As it's often happened in the past, I started typing a comment to some kind of article or post, and three paragraphs later decided I'm better off just writing a post of my own. The thing that's been holding me back from blogging of late is a feeling that I lack the expertise in sports analysis to be helpful - yet I also lack the talent to be truly side-splittingly funny as so many of my fellow bloggers are, so why do people bother reading? In so many ways I trouble that my opinions are just stating the obvious, and then I wonder why the obvious isn't being stated... Well I haven't been reading blogs lately, that's probably why. Anyway, I've been pondering about the closer situation lately, just like everyone else in Red Sox Nation, and as usual I've become disgusted with the lack of creativity and doomsday mentality brought to this issue by our typical WEEI-caller-type fans as well as national beat-writers. Oh, what a shock, the more obvious veteran candidates brought in to compete for the job have been inconsistant at best, each with outings that could kill a vote of confidence from the guy's own grandmother. It's easy for us to look at the pitching line and automatically float a guy out on our mental waiver wire, but we don't really know what's going on. There's a lot happening in Florida, and winning is not a priority- nor is looking good. Major adjustments are being made on the mound in every area from mechanics to communication, and what we've seen in the last few weeks may bear little resemblance to what we will know about our bullpen by June. There's something quite fortifying about the bad-assery that IS Mike Timlin, striding across the outfield to begin the eighth inning. That's right, eighth. Somehow the magic aura fades away if we save him for the ninth. He just doesn't inspire the same "gotta bed of coals? where? here, take my shoes" kind of confidence that we got spoiled with last year. You know, the kind that made us scribble GAME OVER in our mental notebooks as the first notes of our closer's song played on the loudspeakers. Maybe I ought to take a magnifying glass to the numbers, but it just doesn't feel like Timlin closes the door, and isn't that what a "closer" is supposed to do? If we bring him in with two men on base, one of them will score. If we give him a clean slate, he's sure to let one or two on just to pump us all up before he fans the last batter to get out of the inning. On the other hand, it sure does make me feel safer just to know he's packin' out there in the 'pen, ready to march out to the mound at any time and shoot a glare over to the guy at the plate. Lately this league had created demand for the role of "set-up man", something Mike seems better suited for. 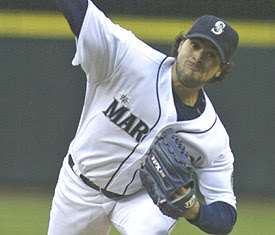 It also better compliments his less visible role as "backbone" of the bullpen. Since he will be starting the season on the DL, I don't think we'll be seeing Timlin close a game until May, and we all hope someone better has emerged by then. Julie sure had a tough crowd when he first got here, and it would be heartwarming to see him redeem first impressions by becoming someone we rely on and cheer for loudest. But I don't think that's going to happen. He certainly has the fire required to close, but perhaps too much; he can tends to self-destruct or even spontaneously combust in a tight spot... not what we need for a nightcap in RSN, I assure you. He has shown flashes of brilliance both internationally and for the Red Sox in the past year, but in a starting role; this makes me suspect Julian needs his full arsenal to be effective, which pitchers need more time to warm up for and often don't use in short relief stints. Tito may try him out to start the season, but Tavarez will likely blow two out of ten save attempts if (he gets the chance) before someone else rises to the top. Then he will settle into the role he is best suited for, long relief fireman. Remember, dude's only here because the Angel's bullpen has too many untouchables to fit him in. Not a power pitcher, but he finesses with the best and wants the ball when the game's on the line, much like our old friend Keith Foulke. Some say that Donnelly's lost a step, but his gamer attitude should fit well in Boston. He will be a key cog for us, but more likely in the sixth and seventh innings. It's hard to predict what will happen with Joel, considering he has gone through his delivery like an Extreme Makeover plastic surgeon with a scalpel this Spring. All we can do is look at his last two years' numbers and HOPE that if he changes absolutely everything, he'll get much different results. Sure, Joel could be our next closer. Theoretically, anything could happen, and it will take the first two months of the season to assess what we have here. By June we ought to see Joel mopping up meaningless innings and on the trading block, hanging out at Blockbuster while on the DL for a "sore shoulder", riding the waiver wire, or buffing up the last bit of polish on his new role as STAR. We'll just have to wait and see. In my next post, I'll discuss the rest of our bullpen. This will include our lefties, who likely won't get considered for the job, our future closers who will end up in Pawtucket waiting for someone to get hurt or blow up, and my personal fave, someone who I think has been virtually ignored in this discussion, Kyle Snyder. Then in part three, I intend to discuss our starters (which ones could make the switch) and all the unrealistic trade options out there. Of course at my rate, we'll have picked a closer by then. But just so you know, I wrote all of this and had it blown away by Blogger because of some supposedly missing html two days ago, and I REWROTE IT FOR YOU TWO PEOPLE WHO STILL VISIT MY BLOG. (you know who you are) I think that shows dedication. And love. And promise, eh? Don't stay a stranger ... I love this ! Dont worry about feeling any lack of anything. Just say what you think. That's why people read! And on that note, I think you're right on the mark about all these guys. Timlin is definetely for the 8th inning. 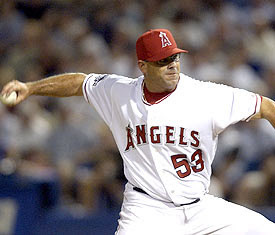 I always liked Donnelly when he was on the Angels so I was pretty happy when the Sox got him. It will be interesting to see how his role plays out. I HAVE THREE READERS! Thank the great spaghetti monster for RSS readers, eh? I might end up with quite a crowd by the end of the day... but really, Dan, the list of my *two* readers was referring to those who actually beg for new posts, like Novella. I'm still reading your blog! FOUR! count 'em, four readers. I am definitely billing ace tickets this month. well ... I ran away for a minute today - and then I got to thinking ... I feel like it's baseball season now cause Reb's posted a post on her blog ! Don't call me pathetic, please ! awww... now it's my turn to blush, Novy! I'm flattered. And further motivated. 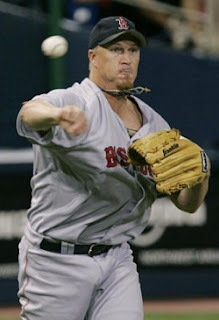 Hey I just read on Shilling's blog that Paps is now the Sox closer! Take care, and since it's Friday, have a great weekend.